After uploading the product on Newegg or after updating the product inventory or the product price, the store owner can check the status of the product feed and sync the selected feeds from the Manage Feed Details page. 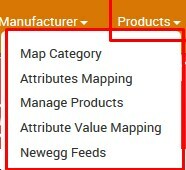 A product feed or product data feed is a file consisting of a list of products and attributes of those products organized so that each product can be displayed in a unique way for the sale. A product feed typically contains a product image, title, product identifier, marketing copy, and product attributes. The admin has to update the feed status to view the product feed status on this page. Select the checkboxes associated with the required feeds. Click the Update Latest Feed button. Once the process is completed the Manage Feed Details page appears. The Feed Update is executed and the status appears on Manage Feed Details page of the app. In the Action column, the View Icon appears. If the error exists, then the Error icon also appears. To view the Feed details, click the View icon. Click the Back button to go back to the Manage Feed Details page.